Over the years, I’ve written about the moral necessity to recognize the Armenian Genocide, in those words, without euphemisms. I’ve maintained my position despite the prevalence of antisemitism in Armenia (read a 2005 report here) as well as a disturbing strain of it found among some Armenian Americans (see this discussion, by an Armenian). One of the common themes in antisemitic revisionist history is that Jews somehow instigated or took part in the actual genocide alongside the Turks. And it is common currency on antisemitic and anti-Zionist websites that Jews and Israel are behind the US government’s failure to recognize the genocide (see for example the slimy Stephen Walt). 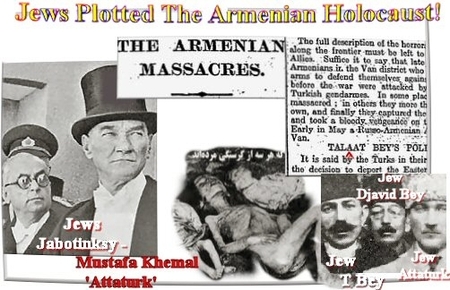 Israel has, for decades, colluded with Turkey in the final stage of the Armenian genocide — denial that it ever happened. [Jews] don’t particularly want to share the genocide label with other groups. I responded that the great majority of Jews and Jewish organizations in the US, with a few exceptions, do call for recognition of the genocide, that those who did not (the ADL in particular) were responding to multiple forms of pressure, including threats against Turkish Jews. It was also to the advantage of the State Department to blame Israel for its own cynical amorality, and they are happy to do that. Moushigian, following Walt, also called attention to the recent cooling of relations between Israel and Turkey, and suggested that AIPAC and Jewish groups might not oppose similar resolutions in the future. For my part, I thought that the State Department might change its tune as a result of Turkey’s recent alignment with the anti-American Iranian bloc. In the meantime, the chairman of the Armenian National Committee of America, Ken Hachikian, criticized Obama for a “disgraceful capitulation to Turkey’s threats” and failing to acknowledge what many historians describe as genocide. “His complicity in Turkey’s denials, and his administration’s active opposition to congressional recognition of the Armenian Genocide represent the very opposite of the principled and honest change he promised to bring to our country’s response to this crime,” Hachikian said. With Turkish PM Erdoğan and the terrorist IHH planning yet another Turkish flotilla to Gaza (delayed only because of upcoming elections in Turkey), I think it’s safe to say that AIPAC, ‘The Lobby’, Israel or Jews in general had absolutely nothing to do with the administration’s failure once again to recognize the genocide. This week it was reported that NATO member Turkey is opening something akin to a Taliban diplomatic mission in Ankara. Turkey supports Hamas and Hizbullah. It has begun training the Syrian military. It supports Iran’s nuclear weapons program. It has become the Iranian regime’s economic lifeline by allowing the mullahs to use Turkish markets to bypass the UN sanctions regime. In less than 10 years, the AKP regime has dismantled Turkey’s strategic alliance with Israel. It has inculcated the formerly tolerant if not pro- Israel Turkish public with virulent anti-Semitism. It is this systematic indoctrination to Jew-hatred that has emboldened Turkish leaders to announce publicly that they support going to war against Israel. As a Zionist, I have consistently called for recognition of the Armenian Genocide, and did not change my position as a result of Turkey’s hostile policies toward Israel. To those Armenians like Marshall Moushigian who choose to blame the Jews, I say: find another scapegoat. Note: The Fresno Bee link to Marshall Moushigian’s original article is not available. My link is to a local copy of it. In his leading article, Al-Quds Al-Arabi editor Abd al-Bari Atwan urged Erdogan not to give in to the Jewish lobby’s “extortion” tactics. You may remember that back in 2007 a similar resolution escaped the Foreign Relations Committee, although it did not survive to become law due to pressure from the Bush Administration. At that time, Turkey threatened to cool relations with Israel, and even hinted that it might not be able to protect Turkish Jews against antisemitic reactions if the resolution passed. In what can only be called an antisemitic failure to understand the relationship between Israel, American Jews and the US government, the Turks seemed to think that Israel could order American Jews and Jewish organizations to apply irresistible pressure against the resolution — because, as everyone knows, US Jews take orders from Jerusalem and control their government! When the ADL, which had originally opposed the resolution, more or less reversed its position as a result of an outcry that it was unthinkable for a Jewish group to be on the wrong side of this kind of issue, the outraged Turkish government complained to Israel. Turkish PM Erdoğan seems to have decided that Turkey’s future lies elsewhere than the Western bloc. His Islamist AKP party has pushed it closer to Iran and Syria and away from the US and Israel. He’s bashed Israel unmercifully over alleged ‘crimes’ in Gaza, and even walked out of a panel with Israeli President Shimon Peres in Davos, Switzerland, in simulated dudgeon. In 2007, Israel and its supporters were sharply attacked by Armenian and liberal groups for their coolness to the genocide resolution. Then, Israel was threatened by Turkey when Jewish groups didn’t ‘follow orders’ to oppose it. Finally, in 2010 when Israel stayed out of the fray — after taking massive abuse from the Turkish PM — it’s criticized for conspiring to ‘contrive’ the issue! It would probably be best for Israel and Jews to simply take the moral point of view and go on record as recognizing the genocide. Probably neither the Turkish nor the Armenian side — not to mention Al-Quds Al-Arabi — can be expected to join the pro-Israel camp no matter what Israel does. I’ve written quite a number of posts on this subject over the years, which you can find here. Recently I’ve received some comments critical of my posts about the Armenian Genocide (there have been quite a few; you can search here). I have asserted that the events of 1915-17 do constitute genocide, and that Turkey should admit that a predecessor regime, the Ottoman Empire, is guilty thereof. any of the following acts committed with intent to destroy, in whole or in part, a national, ethnical, racial or religious group, as such: killing members of the group; causing serious bodily or mental harm to members of the group; deliberately inflicting on the group conditions of life, calculated to bring about its physical destruction in whole or in part; imposing measures intended to prevent births within the group; [and] forcibly transferring children of the group to another group. Did the Ottoman Turks do this to the Armenians in 1915-17? This has two parts: was it aimed specifically at Armenians, as such (as opposed to, e.g., as revolutionaries), and was there intent. One way to determine if it was directed at Armenians qua Armenians is to ask if the victims included a great number of Armenians who were not in any sense combatants — e.g., children, old men, most women. And this was indeed the case, because entire Armenian populations were marched by foot over great distances, during which they died of hunger and disease, as well as deliberate murder. This is quite different from a non-genocidal massacre of political or war prisoners, for example. There is a huge amount of similar eyewitness testimony to these events; to call it all “propaganda” is unreasonable. What about intent? Clearly the meaning is the ‘intent’ of people who were in control of or made use of the mechanisms of the regime. So it could be argued that anti-Jewish pogroms in Czarist Russia were not actually genocidal, even though the regime was antisemitic, insofar as pogroms were initiated by local Jew-haters and not part of a coordinated policy promulgated by the regime. In the case of the Armenians, laws calling for deportation and/or confiscation of property (for example, the Tehcir Law of 1915) were put into place and enforced by Turkish soldiers and police. The population displacement is thus seen to be a deliberate act of the regime, and not either local actions or a result of the disorder associated with war. Even if the minimal estimate of Armenian deaths is accepted, it is still a substantial proportion of the population. It’s clear that Armenians were singled out because they were Armenians, and that the Armenians died as a direct result of orders and policies of the Ottoman regime and in particular the “Three Pashas“. Therefore I conclude that the legal sense of the word ‘genocide’ is correctly applied in speaking of the Armenian Genocide. Whether Jews ought to support Armenian political goals is another question, as is the appropriate attitude toward Turkey, whose new Islamist government is a reason for concern. Note: like the Israeli-Palestinian conflict, it’s almost impossible to find historical material on the Armenian Genocide which is acceptable to both sides. I tried to base my argument only on generally agreed-upon historical facts.